If you want something that’s just fabulous that requires little or no effort, then here you go! 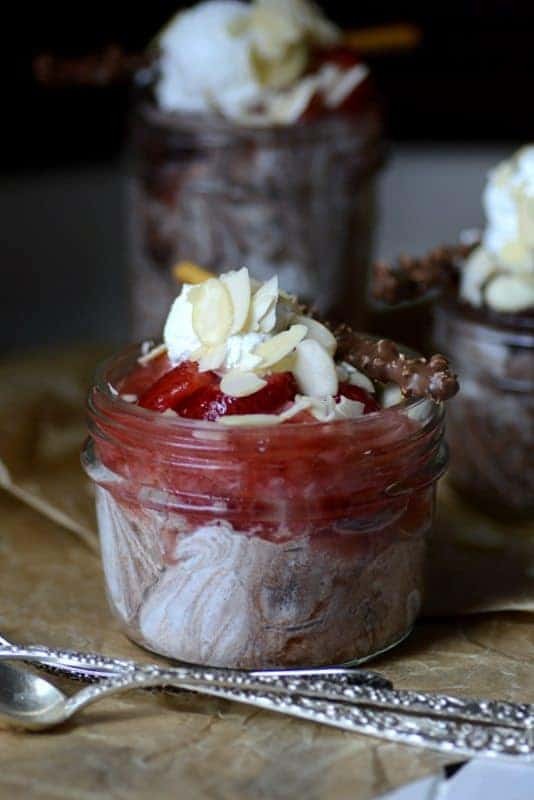 Strawberry chocolate mousse jar! 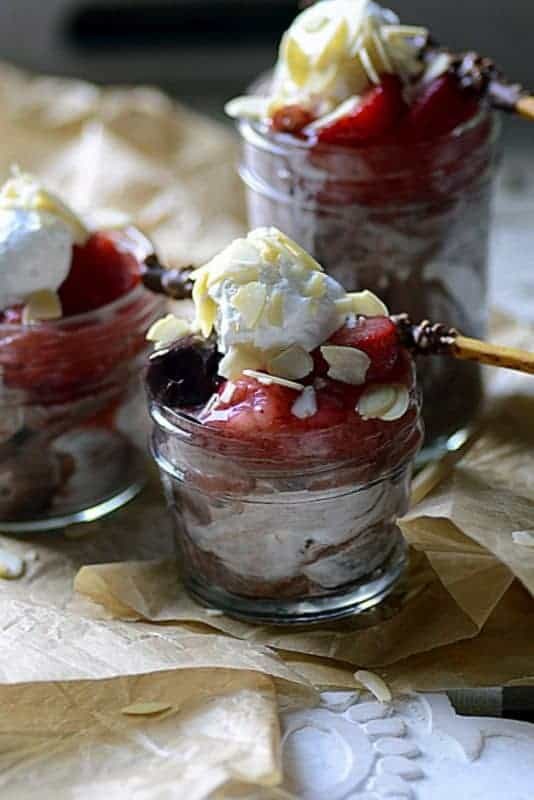 It’s a twist on something that could be you new favorite quick hack for a dessert. One thing I love about Dole Packaged Foods frozen fruits is that it’s ‘summertime all year long’ with their fruit! Really you don’t have to wait for when fruit is in season because their frozen fruits are eerily close to being plucked right from the farm! And, you can get a wide variety of berries, blueberries, blackberries, raspberries and strawberries! Then there are other frozen fruits, pineapple chunks, mandarin orange pieces. Wanna know where the fruit comes from? Well, here you go! There’s nothing artificial about their products. It’s fruit. That’s it. You bet I love being Dole Sunshine’s brand ambassador because they believe in those things that are good for the environment and your health. And, with seven grandchildren, I believe that it’s part of my responsibility to promote foods that are only the best for them. Chill your medium mixing bowl. 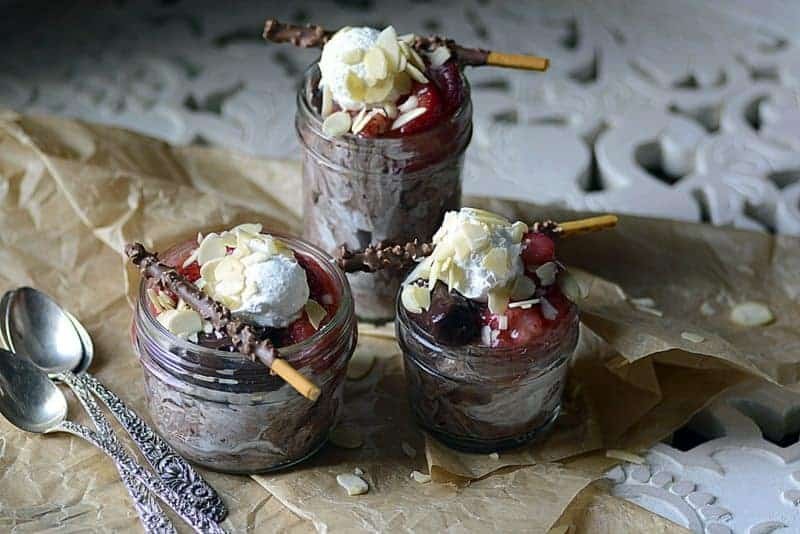 Combine three servings of the pudding and the topping. Gently swirl together leaving ‘streaks’. Dollop equal amounts of the blended mixture into three to four serving jars (i.e., canning jars, 4 to 8 oz. sizes). Spoon equal amounts of the last pudding cup to the side and on top of each mixture. 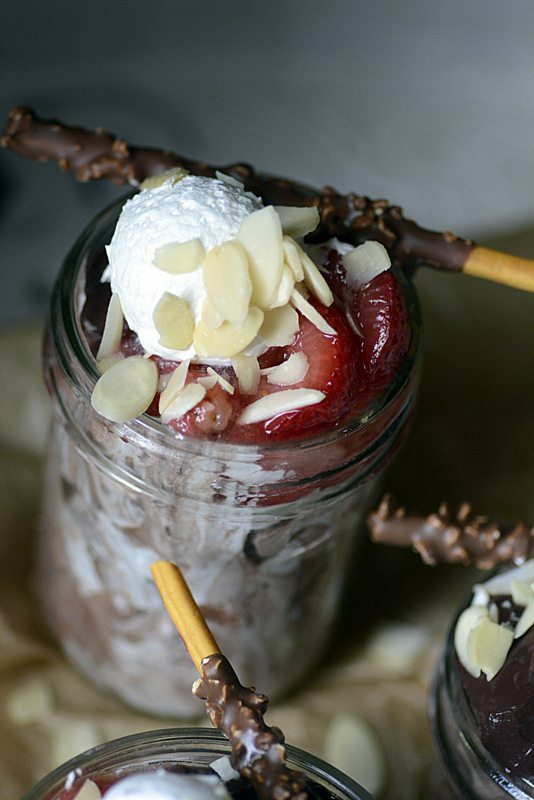 Spoon equal amounts of the thawed smashed strawberries on top next to the chocolate dollop. Use a tablespoon spring scoop and top with cool whip. Garnish each w/a couple of strawberry slices. Sprinkle on the sliced almonds. Place in the refrigerator several inches apart. Cover very loosely with plastic wrap and refrigerate/chill about 15-20 minutes before serving. Garnish with a cookie or cookie stick when serving. If you want to use Dole Sunshine frozen raspberries or blueberries, they're perfect in this recipe, too! If fresh strawberries are available, they make a nice garnish, too. However, you'll want to use the previously frozen in the mousse because the texture works so well with the creamy chocolate 'mousse'! OMG! That looks so good and YUMMY!